The Belen Jesuit boys joined an exclusive club when they became the third boys program to qualify for Nike Cross Nationals in 2011, following the likes of the 2004 Winter Park and 2009 Columbus teams. Coach Frankie Ruiz told us just to be mentioned with those programs is an honor. "I think anytime you are in the company of a few great programs representing a great state like Florida one can't help but be humbly proud and grateful." As a program Belen Jesuit had just won their their fifth state championship in six years, a 26 point romping of 3A competition. Ruiz remembers the NXN Regional in somewhat vivid detail because going into the meet his team knew what they had to do and each runner carried out that plan right from the start. "I know that the confidence we had going into NXN Regionals was really as a result of running so well at state. I always reminded the guys before each meet never to take any competitors lightly and to pay attention to every detail along the way. This approach seemed to pay off with that team and I can honestly say the level of focus and ever-present competitive instinct was intimidating even to me as their coach. Diego Rojo, a junior at the time, says he remembered the thirst for more after winning state. "We didn't let the state title lessen the intensity of our practices, and we made sure not to lose sight of the goal: to make it to Nationals. It was a lot of hard work and sacrifice, but we had been training years for this. That was the strength of our team, our chemistry." The group running under the club name 'Miami Havana' for the postseason, was one that started up through the Belen Jesuit middle school ranks. Each member felt comfortable pushing the other to the fullest extent of their potential. Rojo added that their were runners with incredible talent on that team, so drawing inspiration from each other's accomplishment came second nature. One of those talents was Elliot Clemente, one of two seniors in the group, who would go onto win NXNSE, a year after fellow Miami runner AJ DelValle accomplished the feet in 2010. I remember talking with Clemente the day before the race and him telling me that the team was super excited for the race. "We're looking forward to the competition. It's going to be muddy and all, but that doesn't faze us. We're ready for it.Anyone in the top ten has a chance of coming out on top, but to get there we're going to have perform at our best, do the best we've done, and hopefully that will be enough." Belen Jesuit finished 20th out of 22 teams. Clemente finished as an All-American in 20th and ran at the University of Florida. Coach Ruiz says the results weren't ideal, but it opened up doors for future programs to follow in their footsteps. "I know the results of our race were not anything to be proud of, but I think that 2011 Belen Jesuit team like the others from Florida paved the way for others to follow and be inspired to believe they too can get there. My hope is that the next time Belen gets there we are better prepared for the race and we have a much better outcome." Michael Magoulas, a sophomore at the time, says the NXN experience was one of his favorite high school memories. "My favorite thing about the whole experience was being able to do what I love with my best friends and doing it well. The feeling of working for something and it paying off is good." For Rojo, visiting the Nike headquarters and meeting the dozens of the teams prior to running the race was the highlight of his trip. "Despite the fact that every team would be facing off against one another, there was genuine kind sportsmanship among us all. Every single team at Nationals worked long and hard to get there, many of them had multiple state titles under their belts. Thus, there was a mutual respect and understanding in the air. Everybody out there is gonna run their heart out. You have to want it more than them. If someone is starting to slow down and you're catching up to them, use that to your advantage; it means they're getting tired and you're still going strong so race past them. Always leave every bit of energy on that course; you don't want to regret not giving it your all." Ruiz remember the overall atmosphere created by Nike, a company that has reshaped our sport for the better, and never stopped investing in XC's growth. "Watching the runners get their Nike jerseys the day before the race at the Nike HQ's was surreal and most certainly one of the coolest moments of my career. It all seemed to come together. A company I admired while doing business with and now I was grateful towards for serving a team I coached at a true XC National Championship meet. 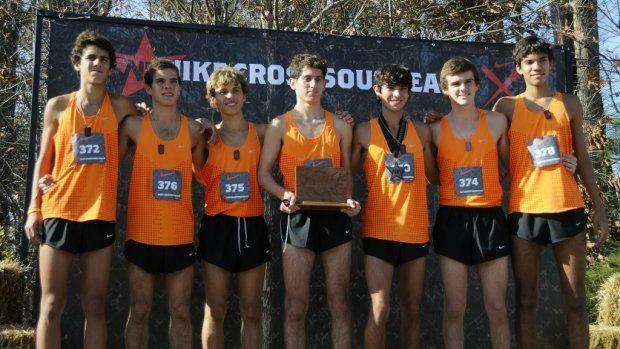 This year's Bolles team will be the fifth boys program to make the coveted trip to Portland, Oregon for NXN. With a flight time of 8-9 hours and the the forecast for Saturday at 45 degrees and an 80 percent chance of rain, the conditions aren't ideal for our Florida contingent. Ruiz says he doesn't have a lot of advice to offer because they are a stellar squad and will be ready to go, but he says he can offer a pre-race prayer for warm or mild weather. "That seemed to hit my guys the hardest. We were the most unprepared team out there in Portland on race morning as that unforgiving cold got the best of all of us. I still remember Alberto Salazar standing near our tent and shaking his head as he watched our guys shiver themselves through their warm up routine. So I guess my advice is to prep for that weather because it is rather far from anything we experience down in the Sunshine State."